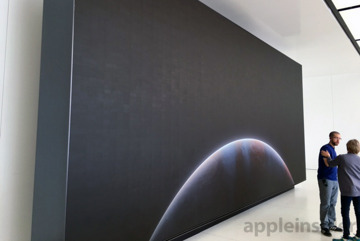 Apple this past weekend opened the doors to one of the first "next-generation" Apple Stores to land stateside, and AppleInsider has exclusive photos of the logo-less facade, custom wooden wall installations and massive 37-foot TV display —rumored to cost $1.5 million —that ties everything together. 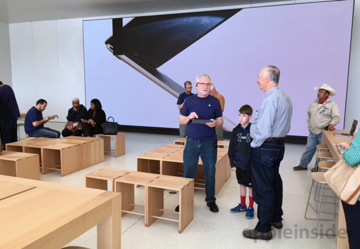 As seen in photos provided by AppleInsider reader Wade, Apple's latest U.S. outlet benefits from the overhauled brick-and-mortar design language dreamed up by retail chief Angela Ahrendts and CDO Jony Ive. The final product matches up with renderings revealed last September. A patented high-flung ceiling sports embedded light panels and recessed spotlights that illuminate product display tables below, arranged to maximize floorspace and achieve a sense of openness. The iconic wooden tables, designed by Ive, are new models with motion sensors that operate a motorized flip-up panel hiding electrical outlets and USB ports. 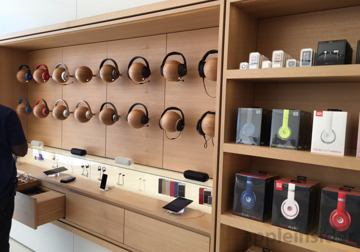 The table is rolling out to Apple Stores around the world. On the walls are Apple's new wooden accessory display installations, dubbed "The Avenue," which feature a headphone tryout area, as well as shelf space for speakers, docks and other paraphernalia. According to Ahrendts, the drawers, cabinets and other interactive flourishes are designed to simulate the feeling of window shopping on a sleepy street in a small town. The main attraction, though, is a gigantic mural-esque television display that stands nearly floor-to-ceiling at the wall opposite the store's all-glass entrance. 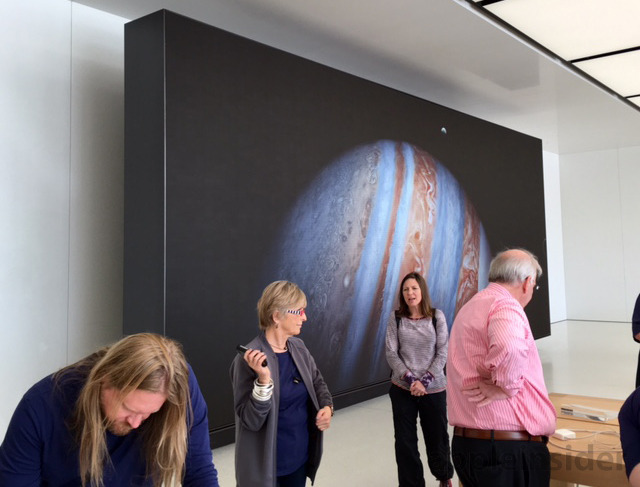 According to reader Wade, the screen came in at a hefty $1.5 million. Seen above running an iPad Pro promo, the high-resolution array displays edge-to-edge images and comes encased in a sleek black housing. 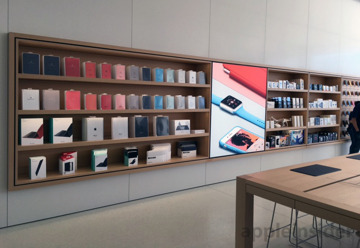 A similar display was seen in footage from a December episode of "60 Minutes," in which Ahrendts led interviewer Charlie Rose through a secret mockup Apple Store located in a nondescript Cupertino warehouse. The Memphis unit, however, appears to be having some issues as a few panels in the top-left corner are currently malfunctioning. 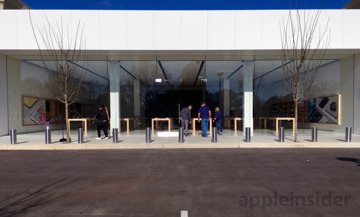 The Saddle Creek Apple Store is located on West Street in Germantown.